Every so often I think to myself, “what ever happened to Evite?” Then I get an email invitation and realize that it’s still alive. While some of the early adopters and tech elitists may have switched to services like MyPunchbowl, Socializr, Pingg, Cocodot, and even MySpace and Facebook, Evite lives on in the minds of many of those outside of the tech sphere. 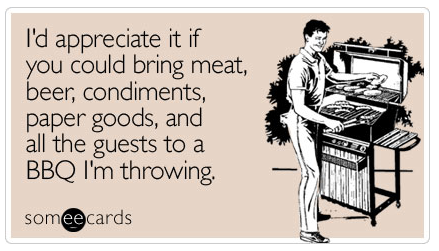 And that’s why Someecards now wants to kill it with a new Invites section of their site. Okay, maybe that’s a little harsh. “The thing is, there’s really nothing wrong with Evite. It’s just not fun, which is really our big point of differentiation. Our site will be fun. And if you’re planing a party, shouldn’t it start off from the point of sending out the invites being fun rather than lame?,” Someecards co-founder Duncan Mitchell explains. 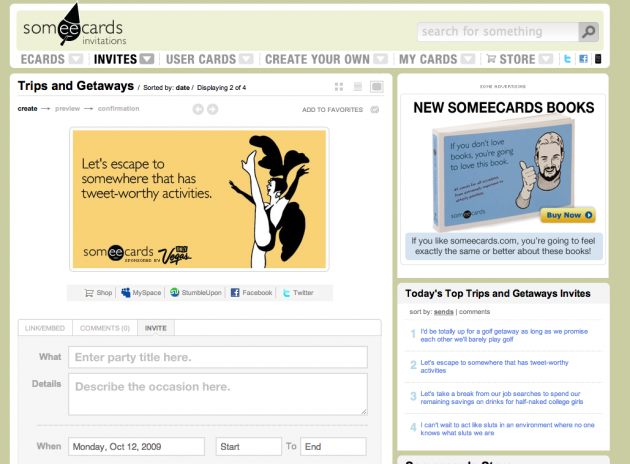 While Someecards has a bunch of cards pre-populated in the Invites section based on the type of party, you can actually make any card on the site into an invitation. Simply find a card you like and click on the Invite tab below it, then enter in the data such as the title of the party, the details, the time and date, and where it will be. Once it’s sent, invitees can comment on the “Party Wall” and attach other Someecards there to express what they are feeling about the event. The plan is also to attach the invitation functionality to all user-generated cards within the next few weeks, we’re told. And eventually Someecards will add Facebook Connect to extend these invites to your Facebook account as well. The monetization plan is the same with the rest of the service. Aside from ads on the site, certain Someecards are sponsored by brands.